Our luxurious bell tents are situated in stunning countryside. The wildflower meadows and woodland are a haven for outdoor enthusiasts. Woodland Retreat (Sleeps 5): This tent in the wood boasts a large deck with a private sauna, loungers and hammock. 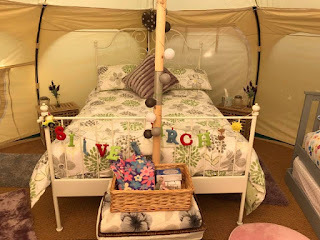 Silver Birch (Sleeps up to 5): The tent comes with doubles, singles and futons. Our tent is nestled in the trees and perfect for a memorable holiday away. Harvest Moon Stargazer (sleeps 5): This beautiful tent comes with a delightful sky observatory and is in a clearing in the wood. Each tent comes with a state of the art composting toilet, outdoor kitchen and outdoor seating area with a firepit. Imagine sitting on the picnic bench with an afternoon tipple whilst savouring the spectacular view.